…keeps the doctor away. That’s how the saying goes right? And oh how I wish that was true right now. Sadly, I have spent almost the entire week at home with the flu. In fact, today is day 4, and I’m getting more than a little stir crazy. Fortunately today I seem to have enough energy to remain upright for extended periods of time, so I’ve decided to be productive and blog. Don’t worry, this won’t be a post about the assortment of juices/coconut water/teas/soups/cough syrups I’ve been consuming over the week. Instead I want to share with you one of the other cookies I baked over Christmas holidays (yes, baked – not like all of the unbaking I did). 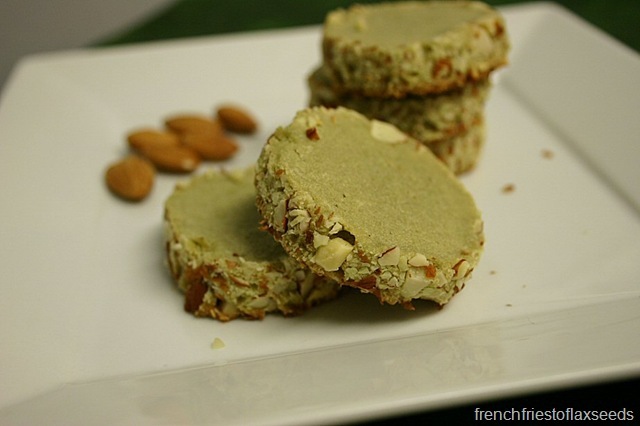 This cookie features one of my favourite teas – matcha! 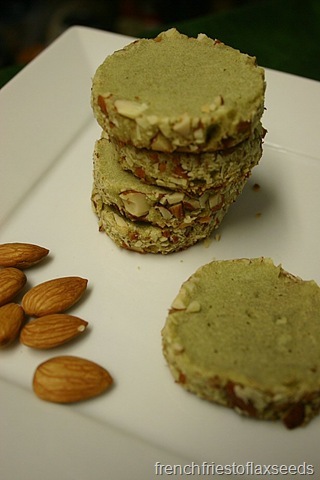 I saw this recipe for Smoked Almond Matcha Tea Cookies on one of my favourite food blogs Fake Food Free, and knew right away I needed to make them. They were a unique cookie worthy of being added to my Christmas baking list. 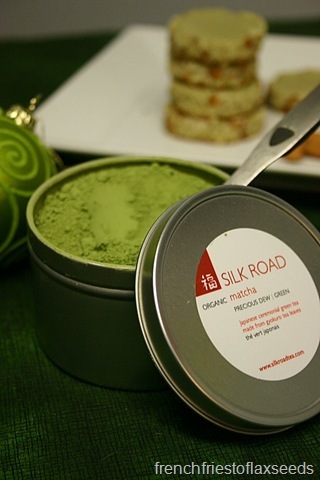 It helped that I had all the ingredients on hand, including my favourite matcha from Silk Road – Precious Dew. They are a great cookie to make ahead, and keep in your freezer for when you have an unexpected need for cookies (say, for guests or cookie cravings). They are one of those “form the dough into logs, chill, then slice” kind of cookies. I can’t say I’ve made many cookies like that before, but I like how uniform it makes the cookies – so much better for even baking. The only minor change I made was to use regular almonds instead of smoked, because that’s what I had on hand. I can imagine the extra depth of flavour they would have added to these buttery little wonders. Regardless, they have a great almond flavour, and are a pretty light green colour (my favourite colour, in case you didn’t know). The pictures don’t quite do them justice – they really are green! The only issue I had with baking them was the bottoms browning more than I would like. They weren’t burnt, but they didn’t look as pretty on the bottom. It could have just been my pans, or even my oven (which seems to have a mind of its own). If you just make sure they are all sitting upright though, it’s all good. Their green colour makes them a perfect Christmas cookie, but there’s no reason you couldn’t make these any time of year. They would be great for an afternoon tea. 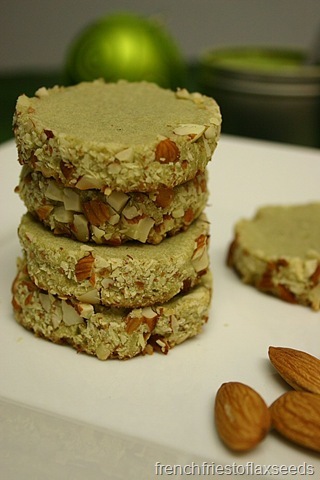 If you love almonds and matcha, give them a go! Thanks for the great recipe Lori! Looks look wonderful!! I used to hate any type of nut in my cookies, now I seek out cookies with nuts! I hope you feel better. I should really get a flu shot, but….I’m a big wimp!! These look tasty. I love me some matcha!! 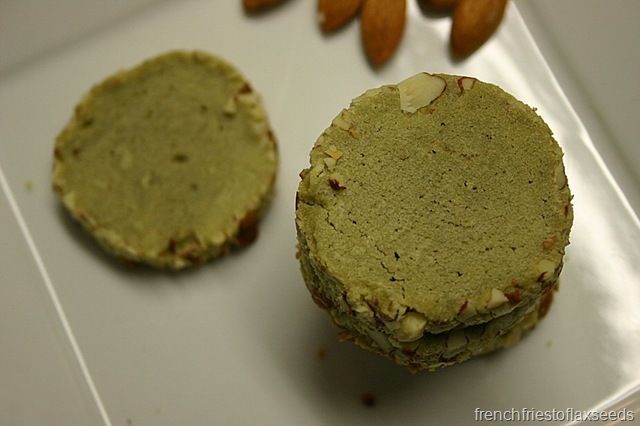 I bought matcha to make my daughter green tea ice cream which is her favorite – those cookies look delicious Marianne! 😀 Have a great weekend! Wow what in interesting a delicious looking cookie! Very unique! mmm i love matcha… so these sound INCREDIBLE! I actually have never made a log cookie recipe…. that you then cut and bake… I should try it! Wow! These cookies look amazing. Yum! What an interesting flavour combo. Thanks so much for the shout out! I’m so glad you tried them! They’ve really become one of my favorites. I may make another batch for Valentine’s Day. 🙂 Yours look great! I agree about the browning. It’s kind of tough to get it even. I tend to have that problem with shortbread-type cookies.